1 How much does the CreateAskate.org program cost? 2 Who pays for the CreateAskate.org skateboard decks? 3 What type of guidelines or instructions do the teachers receive? Q. How much does the CreateAskate.org program cost? A. Each student’s participation fee is $15.00 plus shipping and handling per deck. 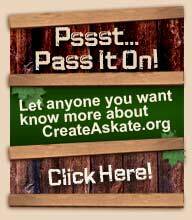 It’s the intent of CreateAskate.org that students be responsible for providing their own participation fee. We believe each student will be more responsible and more vested in the project by providing his or her own fee. Shipping costs are not included in the participation fee, thus, shipping costs, and limited materials costs (paint, sealer, sandpaper, inks, masking tape) are then the responsibility of the school. Click on links to see specific lists. Q. Who pays for the CreateAskate.org skateboard decks? A. Each participating school must set up its own CreateAskate.org account to process orders and select payment options. Q. What type of guidelines or instructions do the teachers receive? A. Each teacher receives a comprehensive step-by-step Media and Instruction kit. The CreateAskate.org curriculum contains vocabularies, quizzes, and charts and templates, in addition to video (DVD) media offering source information as well as step-by-step demonstrations of how each student can successfully complete their own custom skateboard deck. 2) Tape measure or ruler with 32nd scale. 4) 3” wide x 21 1/4” long Sanding belts. 36, 50, 80, 100 grits. 5) 1 sheet of 120 grit sandpaper per student. 6) Any other artistic medium needed. 6) 1 pencil per student. 2) 1 marked skateboard blank per student. 12) Any other artistic medium needed.